Executive Director Caleb Cage of the Nevada Office of Veterans Services (NOVS) was the featured speaker on February 17, 2011 at Tamarack Junction in Reno. There was good food, camaraderie and Mr. Cage's talk about things going in NOVS. Reno High School JROTC presented the colors and the National Anthem was sung by Cadet Kylie Boes. 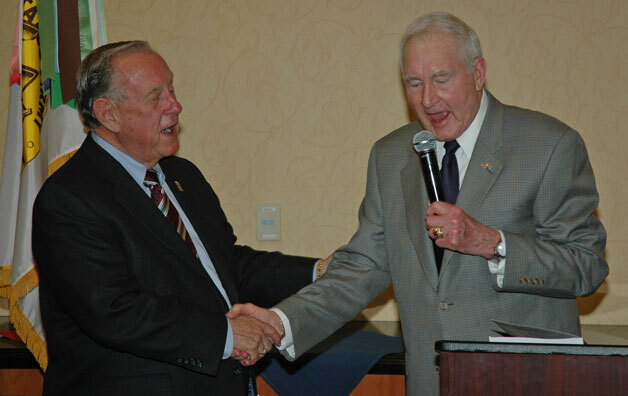 Colonel Jack Logan (USA, Retired) was inducted into the University of Nevada Reno's ROTC Hall of Fame in conjunction with Nevada’s commissioning ceremony on December 4, 2009. Lieutenant Colonel Bart Tragemann, the Professor of Military Science at Nevada, conducted the ceremony and presented Logan with a plaque and commemorative coin. COL Logan was accompanied by his wife, Jenny. Although Logan was not commissioned through ROTC, he has several years of association with college level programs beginning with a three year assignment as an Assistant PMS at the University of Colorado. His final active duty assignment was as the Chief of Staff of the Fourth ROTC Region which included the program in Nevada. As President of the Westmoreland Chapter, he has been active in furthering the support of the Chapter for both Junior and Senior ROTC programs. 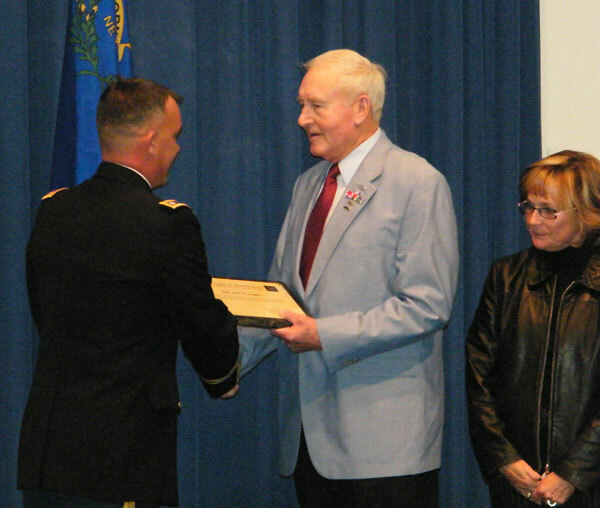 At a ceremony on 9 October at the State Headquarters of the Army National Guard in Carson City, Westmoreland members COL(Ret) Charles Grundy and CSM(Ret) Leroy Albin were inducted into the Nevada National Guard Hall of Fame. 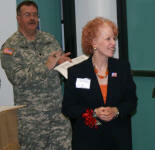 CMS Albin retired from the Nevada National Guard after 26 years of service. He was assigned to military police units, medical detachment units, aviation units, recruiting and retention commands, and signal and armor battalions. Albin continues to work closely with the Nevada National Guard and he is an instructor for the Junior Reserve Officer Training Corps at Hug High in Reno. He is an active member of several military organizations, including AUSA, and is currently perusing a master’s degree in Education Leadership at the University of Nevada, Reno. The General Westmoreland AUSA Chapter, the West Point Society of Northern Nevada and the National Security Forum were honored to welcome General George Casey, Chief of Staff of the US Army to the Reno/Sparks area. During the dinner at John Ascuaga's nugget, General Casey spoke about "Transitioning the Army for the 21st Century Battlefield" and answered many questions about the Army; operations in Iraq and Afghanistan; and the world military/political environment--current and future. Among those attending this event were Governor Jim Gibbons, former Congresswoman Barbara Vucanovich, Sparks Mayor Geno Martini, retired General John Abizaid, Nevada Army National Guard Commander Brigadier General Frank Gonzales, Washoe County Sheriff Mike Haley and a number of ROTC cadets from UNR and Reno High School. (See more pictures in the Photo Gallery.). 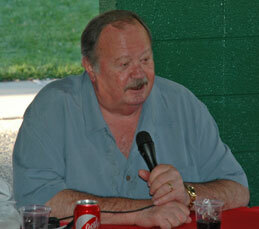 In addition to the normal hot dogs, hamburgers, chips, and beverages, this year's picnic featured long-time Reno newsman Tad Dunbar. Tad spoke about how he got into the news business, told many anecdotes about his career and answered questions from the picnickers. 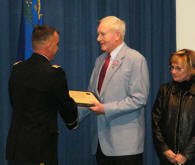 LTC(Ret) Sharlee Smith has been inducted into the Nevada Army National Guard's Hall of Fame. LTC Sharlee, a 1970 graduate of Hug High School, has a distinguished career combining active Army service, Army Reserve service and service with the National Guard since 1989. Her final assignment was as the Guard Mobilization Officer. Among her decorations, she received the Legion of Merit and the Nevada Distinguished Service Medal upon retirement. Sharlee is active in a number of community organizations, most of which focus on support of veterans and their families. A long time member of the Chapter Executive Committee, LTC Sharlee is currently the Vice President for National Guard Affairs. A total of 84 attendees came together to celebrate Veterans Day at the Tamarack Junction on Friday evening, November 14, 2008. We were delighted to have Lieutenant Colonel Dan Waters of the Army National Guard as our speaker, who presented a PowerPoint presentation on "Afghanistan, the Long Commitment." BG(Ret) Doug Byington, Nevada AUSA President, also gave awards to four members of our chapter for their outstanding service to AUSA and to the General Westmoreland Chapter. COL(Ret) Richard Hobbs and Lucre) Sharlee Smith were presented with the Sixth Region President's Medal. Also receiving recognition for their service were COL(Ret) Robert Fritz and Sally Grundy. Both received the Sixth Region Certificate of Commendation. 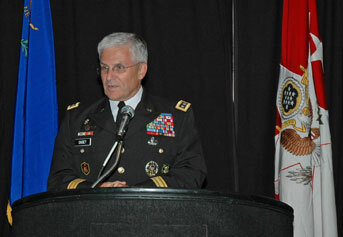 COL Fritz created our website and serves as the Chapter Webmaster. 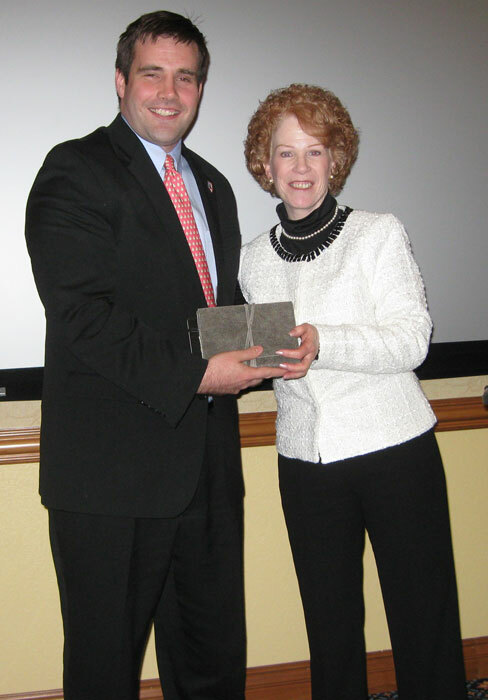 Sally Grundy was recognized for her decade of service as a Chapter Volunteer who always tackled the hard jobs. 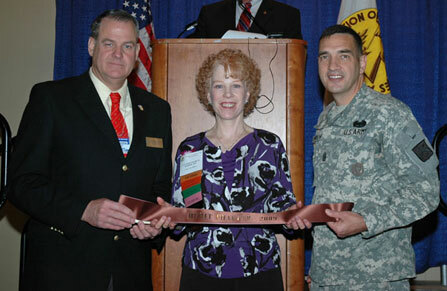 The Chapter was awarded three streamers at the 6th Region Breakfast during the AUSA Annual Meeting and Exposition in Washington DC on October 6-8, 2008. COL(Ret) Bob Fritz represented the chapter at the breakfast and the subsequent Region Business Meeting. 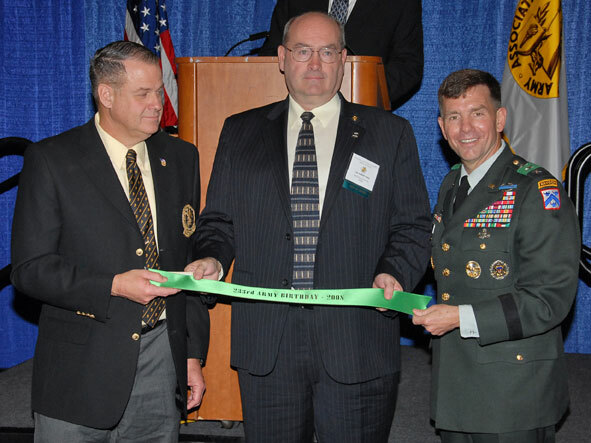 In the photo, Region President George Lanning (left) and LTG William E. Caldwell, CG, US Army Combined Arms Center and Forth Leavenworth (right) present the chapter with streamers for qualifying as a Merit Chapter for 2008; Best Chapter Support of ROTC in 2008; and Army Birthday 2008. No other newspaper better understands and reaches The Army than AUSA NEWS. Reaching key figures in uniform, industry, Congress, the Pentagon and the White House, AUSA NEWS offers a unique monthly insight into what service leaders are thinking, what Congress is changing and what soldiers, their families, veterans, businessmen and businesswomen are saying and doing in the world's premier landpower force. Its timely reporting on subjects of direct importance to America's Army makes AUSA NEWS must reading for all ranks in the active force, United States Army Reserve, Army National Guard and all doing business with the Army. 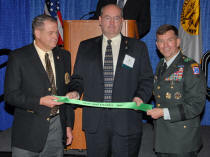 The Institute of Land Warfare (ILW) extends the influence of AUSA by informing and educating its members; local, regional and national leaders; and the American public, on the critical nature of land forces and the importance of the United States Army. ILW carries out a broad program of activities including the publication of professional research papers, newsletters, background briefs, essays and special reports. Some documents on this page are published in Adobe Acrobat format. If you don't have the latest version, download the free Adobe Reader.